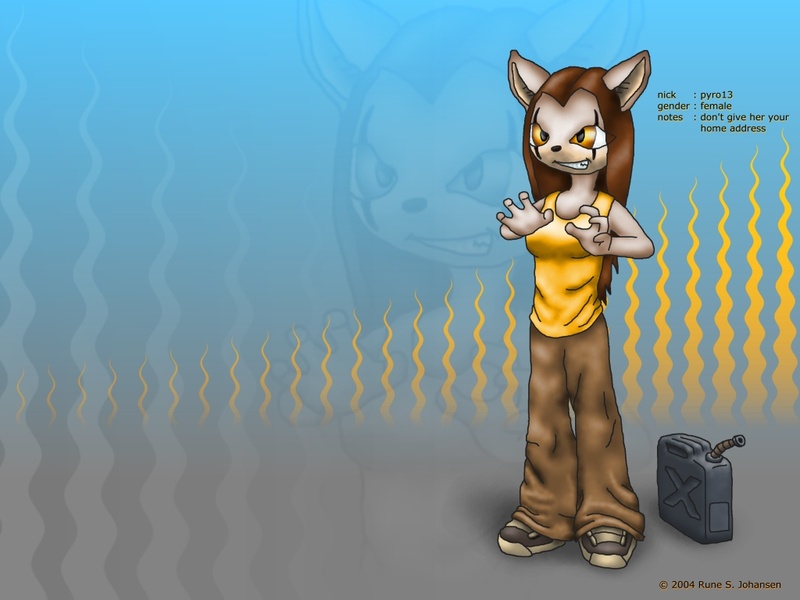 Here you can see all my best graphics and 3D images. Instead of sticking to a certain style, I make many different types of images such as abstract, fantasy, realistic, visual illusions, and much more. 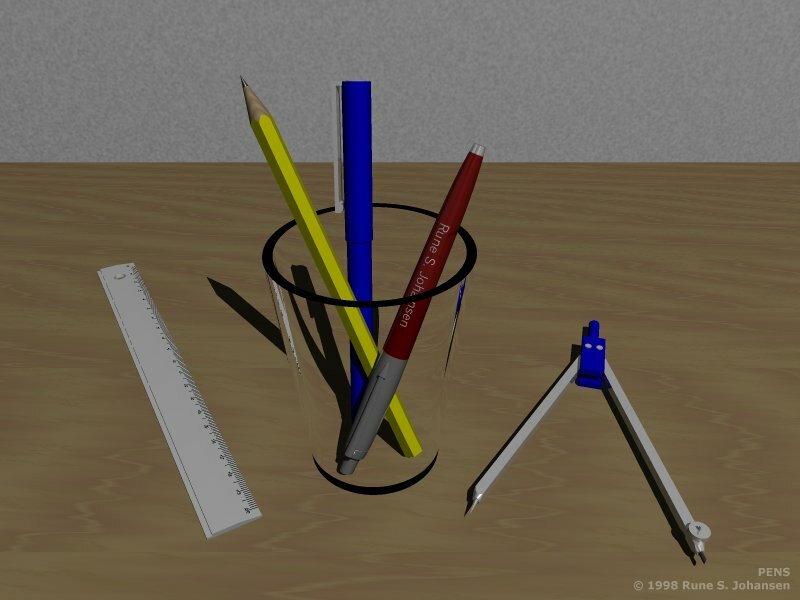 The 3D images are made with POV-Ray. I write them in POV-Ray code without use of any modeling tools. You can download the source code for most those. The non-3D works are made in Paint Shop Pro. Enjoy, and leave a comment if you like. Metal & Flowers is a series of six images, Part I to VI, which form a larger motive when combined. It's an exercise in playful ironic contrasts, both visually and thematically. 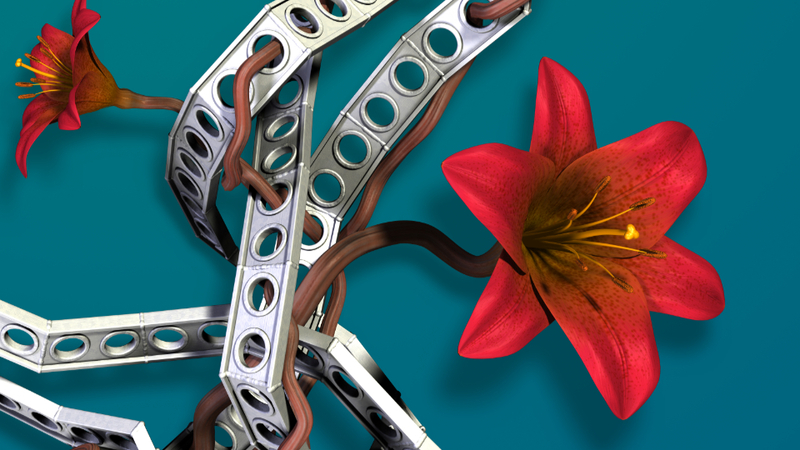 Furthermore it is the craftiest graphical artwork I have made to date, with extreme attention to detail derived from a study of countless close-up reference images of lilies and welded metal. The largest of the images is targeted at 60x90 cm in print and have been rendered at 7087x4724 pixels. The overall theme is the artificial versus the organic. The metal structures represent man's hard inventions, yet they seem to grow in an organic fashion. The flowers are nature's beauty, yet on closer inspection they are a bit too flawless and correspond to no actual real-world flowers, combining the flower of a lily with the stem of a vine. On the technical side, the welded metal girder structures are programmed to follow splines I have plotted by hand, while the flower stems have been created using an inverse growing algorithm that grows from the flower positions and down, clinging onto the girders. While the graphics were completed in 2008, I didn't get them printed until 2013. Now they're decorating my wall as a cross between normal posters and an installation piece. 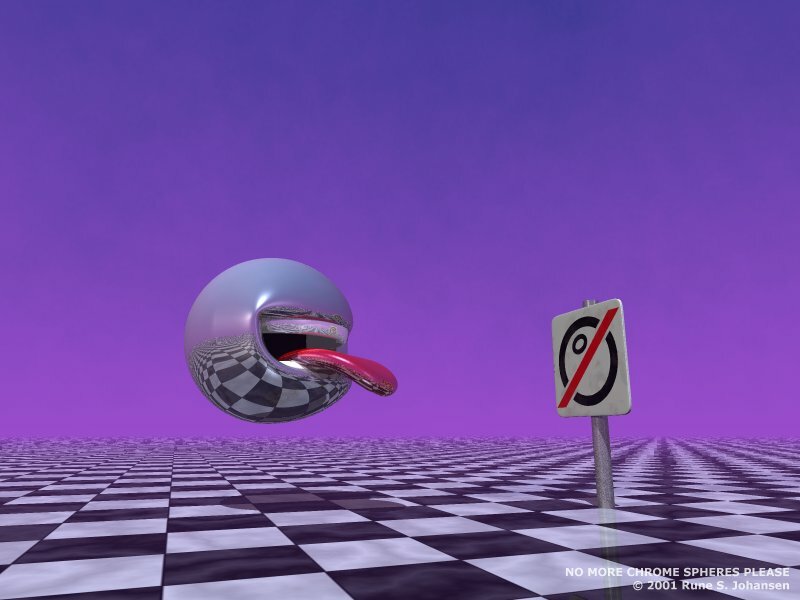 Gee, has it really been 6 years since my last image my 3d gallery? Well, I've been busy with making animations instead, studying and Real Life. But yesterday I just spontaneously felt like doing a simple 3d image again, and whipped up this one in a couple of hours. It takes up only few lines of code. It took 13 minutes to render with area_lights and focal blur. I never draw - almost. A shame really, because once I do, I enjoy it, and sometimes the results even look decent. Well here's one drawing. I started it long ago but only just finished it now. I wanted to make a personal front and back for my calendar. I made some graphics that sort of captures a life philosophy I follow. The idea is that if you manage to both think and feel, you will come far. Well, the image and the words in it describes it best... After having searched the net for fitting quotes with no success, I made up the text for the back myself. Everything but the text was made in POV-Ray, but since the graphics are not 3d-like at all, I don't consider them 3d graphics, even though a 3d program was used as one of the tools. It just happens that POV-Ray is very good at creating patterns, also for 2d. This concept was formed in my head in the fall of 2002, but not until now (summer 2003) have I gotten it into image form. 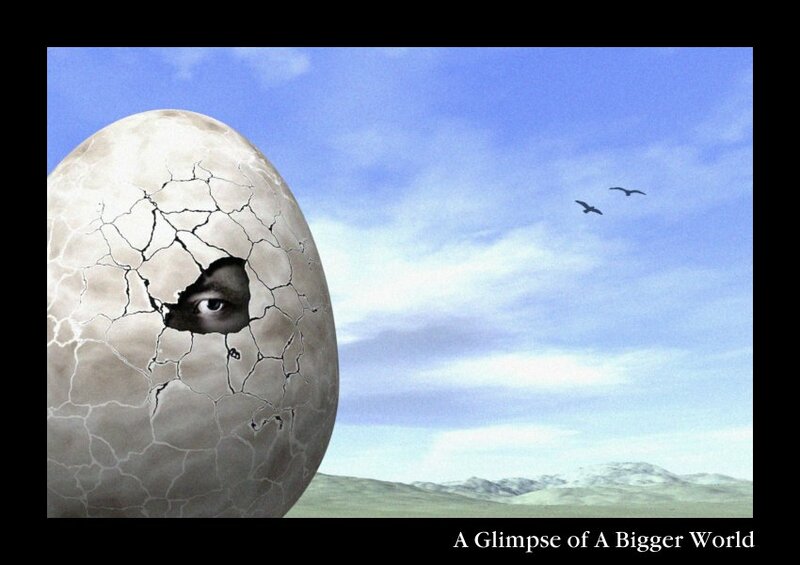 The image is meant to illustrate the feeling of isolation and disparity between the figure inside the egg and its surroundings. The pain of knowing what you are missing, but being unable to pursue it. I attempted to create a strong contrast between the pale face hidden in the shadows of the confining grayish egg, and the bright, limitless landscape outside with a blue sky and the two birds symbolizing social life or perhaps even love. The egg and the landscape and sky are rendered in POV-Ray, but the hole in the egg, the eye and the birds were added in post processing in Paint Shop Pro, so in my eyes this image does not count as being a 3d image (although a 3d program was used as one of the tools). The pattern was made in POV-Ray and blurred slightly in Paint Shop Pro. Thanks to Peter Houston who has made Blob_Man People. 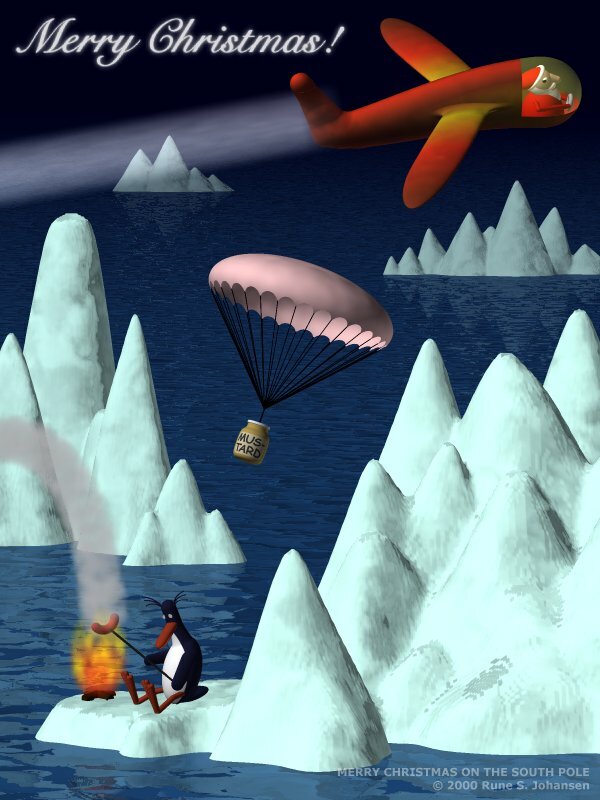 A sweet naive image almost childish in style where Santa comes by the South Pole and makes Christmas just a bit happier for a lone penguin. :) It is based on a handdrawn illustration I saw on the front of a journal. I thought it was so sweet I decided to recreate it as a 3D image. I've tried to adhere to the cute childish style but also give it my own touch. I can't find the original anywhere on the net, so I'm not able to direct you to it... Anyway, have a merry Christmas and a happy New Year! 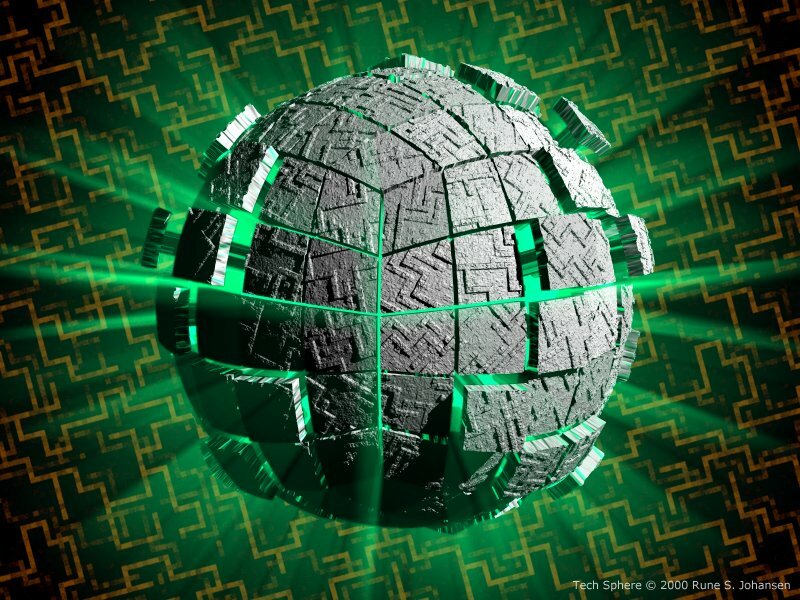 An abstract tech sphere consisting of many metal plates of which some are elevated, revealing a green glow coming from the inside. Some people have pointed out to me that it looks a little like a "borg sphere" (from a StarTrek movie I think - you can see one here). Well, I had never seen a borg sphere, so it was not intentional, but maybe interesting nonetheles... One way or the other: Enjoy! Thanks to Chris Colefax who has made the Spline Macro System. 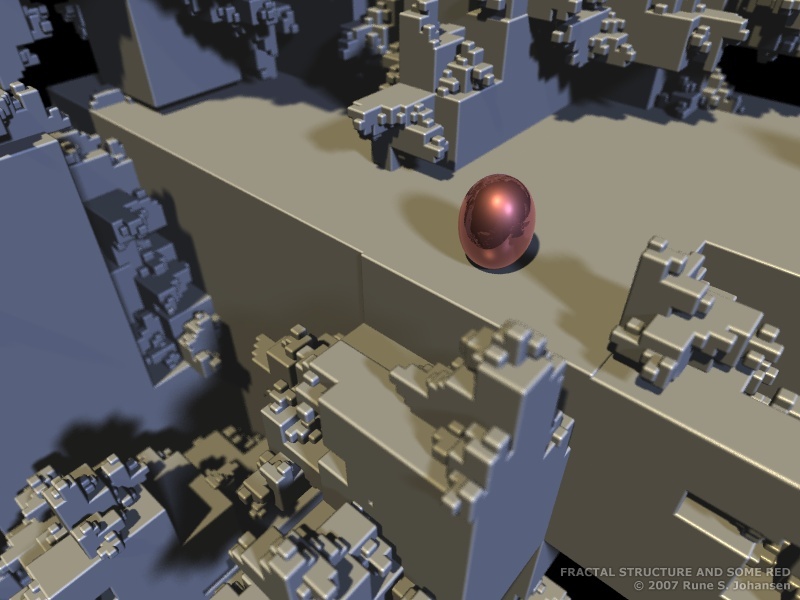 If you want to render the source code it requires Chris Colefax's Spline Macro System. 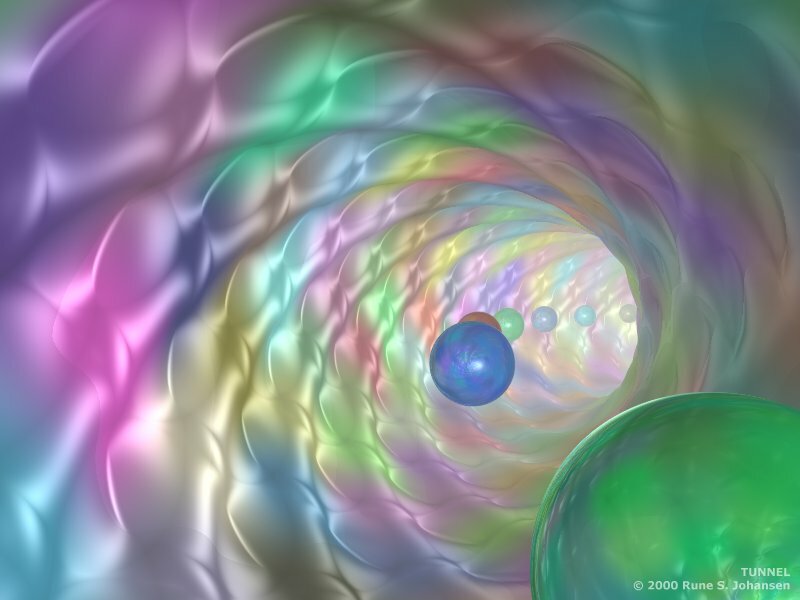 An abstract, bright colorful tunnel. 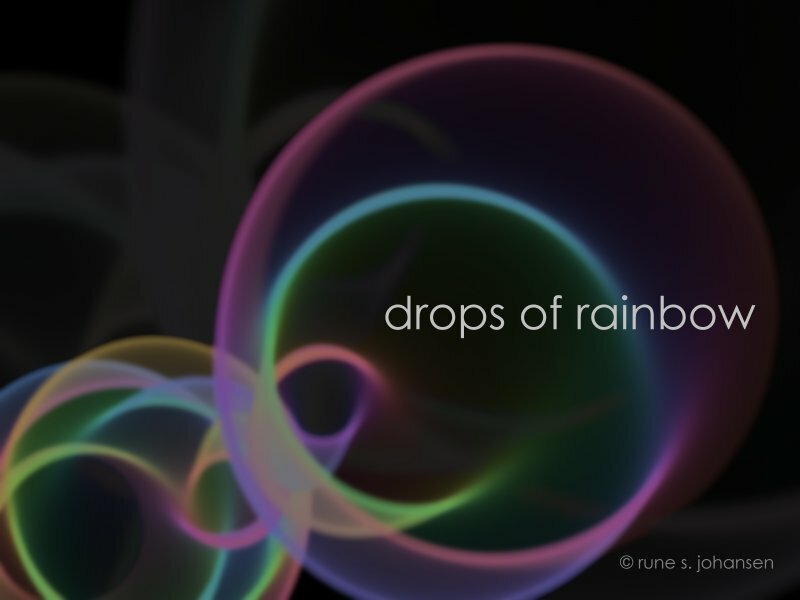 An abstract image like this is rather quick and easy to make, so I guess I should be making more of these. The tunnel is one big blob object with randomly colored blob elements. The blob elements are automatically placed with some rotate and translate funktions inside a #while-loop. 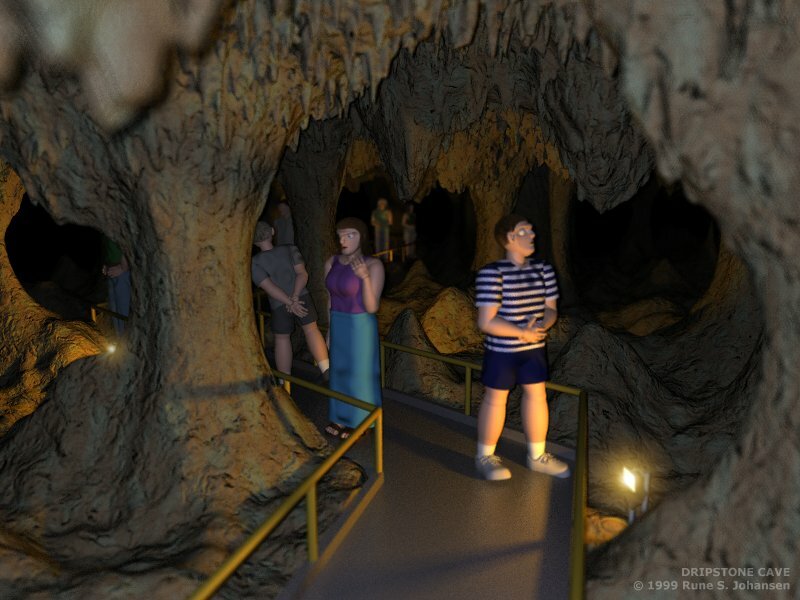 Some tourists walking around in a dripstone cave. The cave itself is made of two heightfields only. Special thanks to Anthony L. Bennett who has done this 28 hour long render for me on his computer! Also thanks to Peter Houston who has made Blob_Man (clothes exclusive), and to Chris Colefax who has made the Lens Effects Include file. What is real and what isn't? Who knows? This image is made using my Illusion Include File. 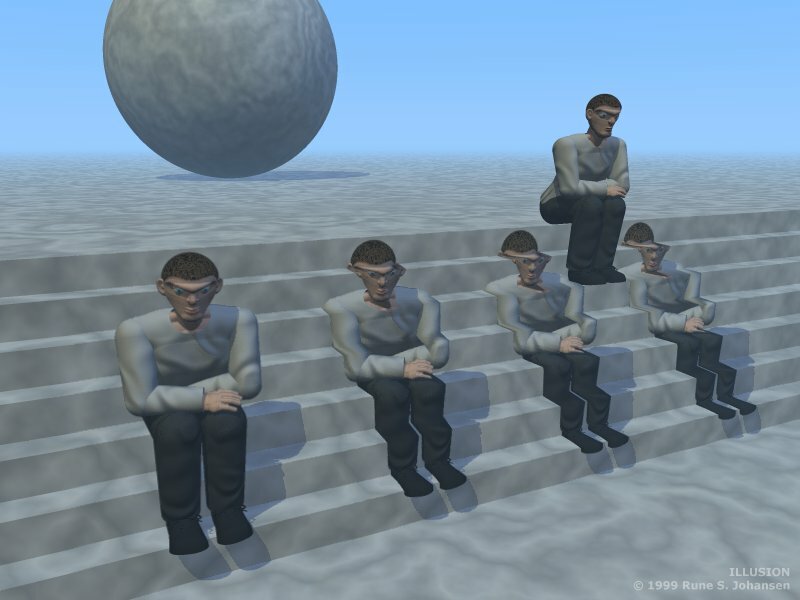 It seems like there's sitting a man on the steps but when you look at the other men you realize that it's just a kind of drawings on the steps. Thanks to Peter Houston who has made Blob_Man (clothes exclusive). 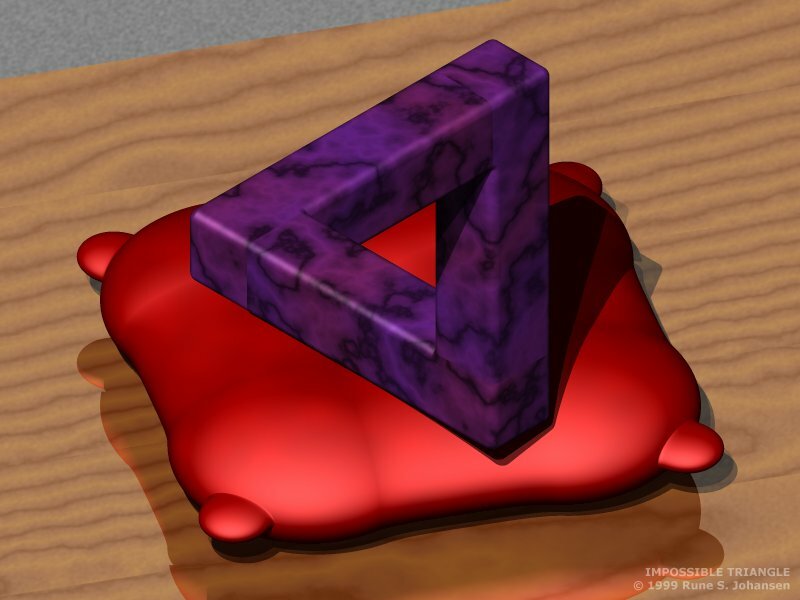 A triangle which can not possible be made in reality. I've made it almost impossible to see where the "break" is. In fact, the only possible way, if any, would be to look at the shadows. The rounded edges sure made it much harder to make the magic trick. The pillow is a blob-object and the wood table surface texture is a wood pattern with various warps. Overview picture of a red dragon I made. 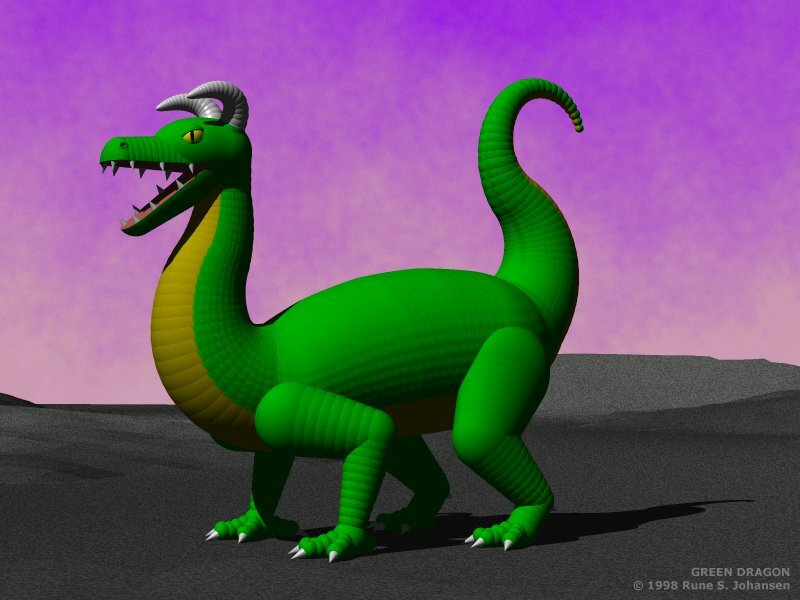 The body, neck, and tail are just scaled, rotated, and translated spheres using nested unions. The head and the legs are csg objects too. 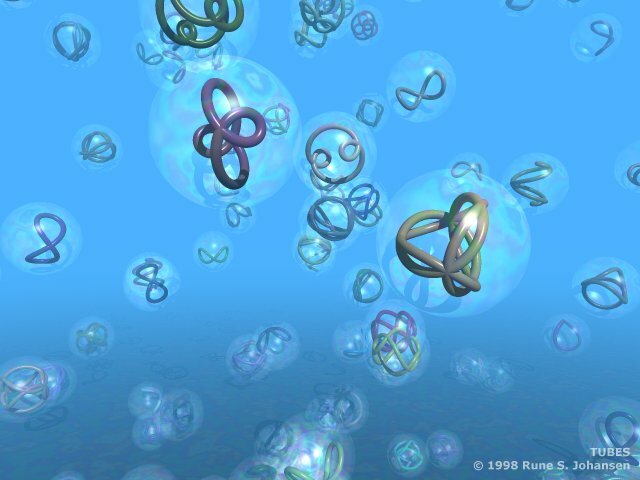 Some colored strange tubes in flying bubbles. 100 tranparant bubbles + 100 tubes each made of 1024 spheres. Locations and colors of tubes are random. 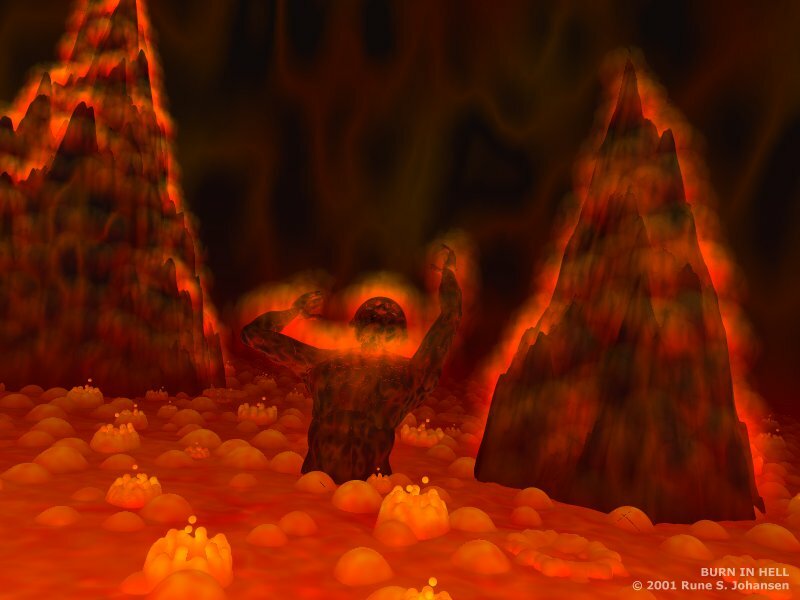 This image took 5 hours to render. 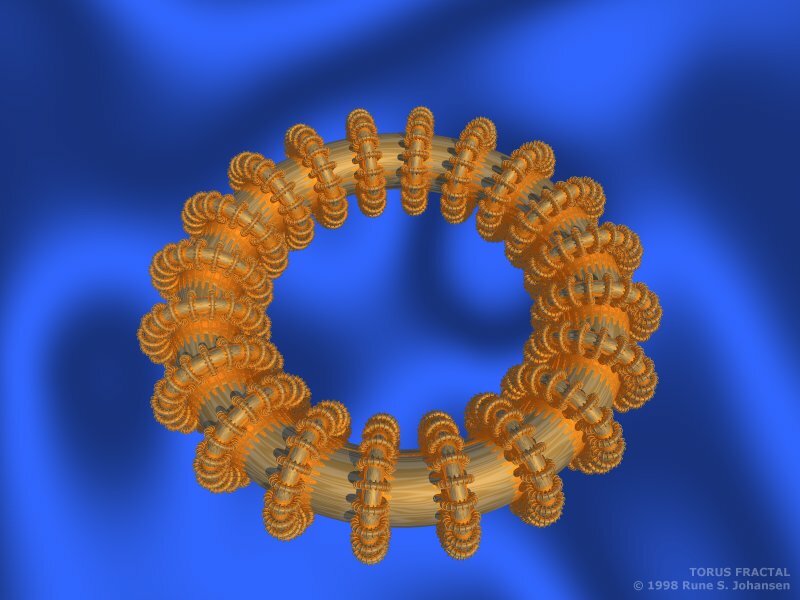 A gold torus with 20 small toruses each with 20 even smaller toruses ect... I made this when I played around with recursive macros. This is my first dragon. He has no wings... He reminds me of a dog... 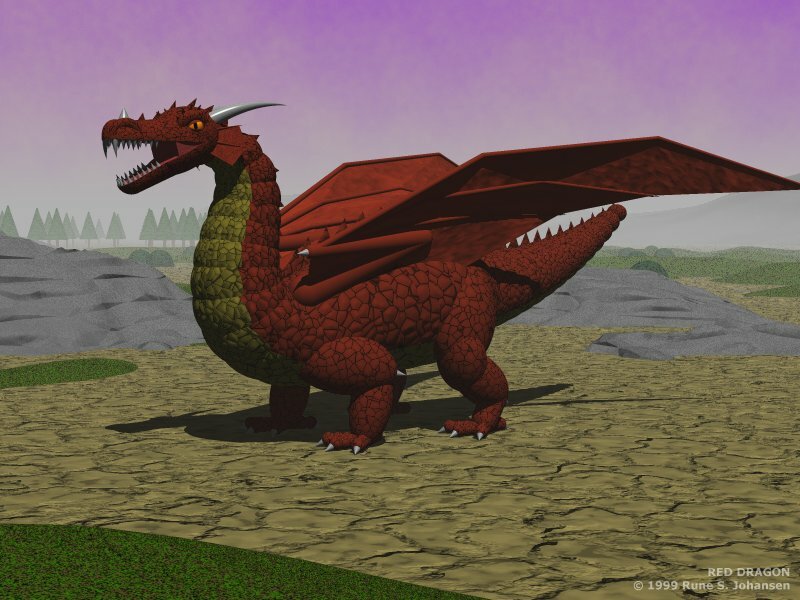 It is made pretty much the same way as my new dragon (the red one), but is uses a lot more objects which make it much slower to render, still it looks much more stupid. Still life with drawing tools. My first "real" image made with POV-Ray. It was pretty difficult to rotate and translate the pens so they touched but didn't intersect with each other and the glass.